PARA TODOS INCLUSIVE LOS NICAS DE LAS ENDURO... La DT200 37F de un panal sin carburador de guillotina, sin limarle nada ni hacerle mucho mate es mas rapida que la Wr, hasta la 200 de 2 radiadores se come la Wr, no ve que esas Wr son para lujo y exhibición nada mas. Fantastiska salys! Noresi tiesiog siesti i liektuva ir skrysti prie saules ir vandenyno. Birzelio menesi aplankysiu si miesta ir pamatysiu viska savo akimis - mano draugai ten bus pagal mainu programa, todel gyvenimas kainuos nedaug. Adidas Gazelle 40 Do you like to email your apple ipad images to friends and relations? You will discover a fairly easy technique of doing this. Just choose the picture you need to talk about, then click the arrow option in the top right spot. You will notice a choice there which you can use to e mail the photograph. Give your potential customers a means to share your articles. If an individual likes your content and wishes to reveal it, you must enable this. The better personal content material shares you have, the more your web site generally seems to the search engines. Sharing may also greatly increase audience, by letting people that might not search for you, to view your articles in any case. This window belongs to a primary school and when u take this pic possibly the date is around 29 of october or 23 of april. Those are our national special days. Panama es y sera siempre parte de colombia. es tan magnificent que voy palla. Here in colombia we have something similar, in Zipaquira, Salt Cathedral (La Catedral de Sal) near Bogota, Capital of our country. Estás en Iran o estás participando del Rally Paris-Dakar? Hermosa! 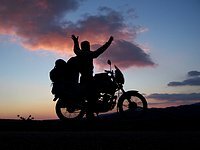 Did you encounter any danger or feeling unsafe during your trip.from your photos, everything looked ok..
hello, you are afew lucky guys who successfully traveled by bike around the world. i am reading and looking the photos. its wonderful. as amuslim country,mosques can be seen in many places in malaysia. I can say this is a beatiful mosque. Awesome! What an inspiration! A friend and I are doing a trip in August from UK to Spain definitely going through Andorra now! The name of the town is Ieper (Ypres), best known for the absolute destruction during the First World War. She is not an Iranian woman. She is an Arabian Tourist. Ich Komme aus dem Iran. Aber Ich libe Österreich. Naci en Guatemala, vivo fuera del pais por mas de 30 anios. Mi nieto esta haciendo un trabsjo de su pais (Guatemala). Ayudandolo a recaudar informacion GRACIAS A USTEDES . Los mios y yo hemos aprendido mas de nuestra bella Guatemala. Gracias por tan lindo trabajo, ayuds, beneficia y ensenia. Att. Olimpia Marquez. How did you like Poland, Generaly ? Love this picture. Reminds me my childhood. Well, it\'s not quite right it\'s not the centre of Szczecin. I\'d say somhere between Brama Portowa and Plac Rodła. I like your pictures! Tak to są \"leniwe\". Tyle ich zjadłem, że nie mogę się mylić:). Shame on you Monika from Elblag:). Again: The women have to be covered at all times. Very very bad situation for humanity. Yes, unfortunately the women have to be covered at all times. It\'s very bad for women life. The Eastern of the world, people are very hospitality... Turkey, Iran, India are samed with this subject. The Mount Agri (Ararat) is longest mountain in Turkiye. Every hiker wants hike to Agri someday for their life. Çay is the most popular hot drink in Turkey. And It must be in this type glass absolutely. Hımm, Dragstar befit you dude! You look so famous! Hey, this man kiss the woman! Excellent photo Gustavo! Hola Manuel vendes tu xt 500? Gracias por responder mi mail. wilfredo. es cierto. este es un chilamate. no un guanacaste. Mucha gente se confunde. pero jamás nosotros. saya suka engine power,top speed 165 gto 110 thn 80. No hay como estar ahi. y ver esa creasion. es expectacular. the scenic view is so lovely. endless view! Hope one day will step foot to this country! W.O.W!unique and interesting!one glimpse i thought it was the work of earthquake! Sweet, adorable and friendly little friend. I like. [quote]by steve - nimes - France - 02-May-2010, 12:22:18 PM i know of the longway round , now i see you took the easy way round , steve wonder could of driven on your route. did you travel first class or economy when you took the plane on half of your journey. Steve ------------------------------------ Answer from Gustavo: if it is easy, do it yourself. 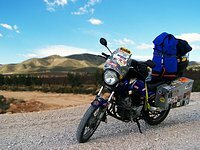 Grab a 125cc, just USD2000 in your pocket and cross 45 countries during 6 years making the money on the way. But I\'m sure you are just a bigmouth, not big balls. ;) Totally agree with Gustavo, the internet breeds idiots like this all the time, yes, steve......you try it!